As kids, playtime meant dressing up with whatever items were on hand, whether that meant crudely taped together paper crowns or plastic Nerf guns from the basement. However, Diamond Bar High School juniors Thomas Yip and Jerry Su have taken it a step further with their fascination with World War II. The two own many WWII uniforms—every detail down to the badges, buckles and medals are historically accurate—as well as various models of airsoft guns modeled after the actual ones used in the war. The uniforms are just one part of their WWII-inspired hobby; they also avidly participate in acting out reenactments of WWII battles. 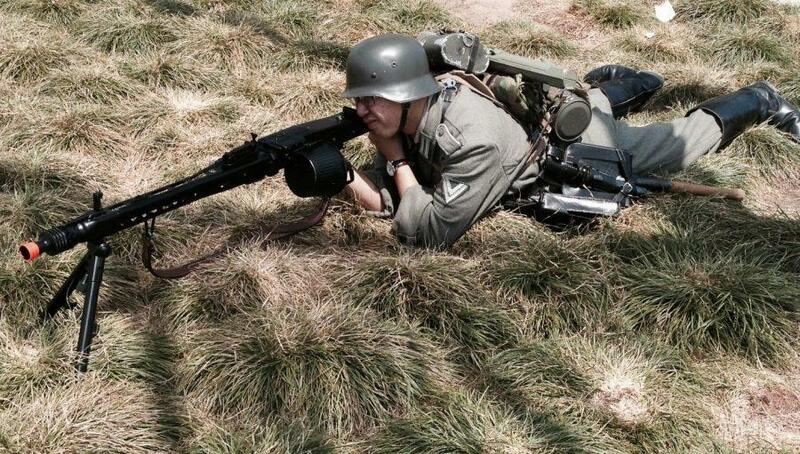 Every month, the duo join other WWII enthusiasts to reenact various WWII battles. In front of crowds of around 200 to 300 spectators, two teams of 45 to 60 people, all dressed in WWII gear, spread out across either a field or forest that serves as a mock battlefield for the day. Based on the briefing and instructions given by the command officer moments before, the two sides fire blanks at each other as the announcer introduces the scenario and background to the audience. Later, as the mock battle takes place, the announcer explains the events happening on the field and the significance of the battle. Yip usually wears his German uniform and carries a blank fire K98 rifle for reenactments along with most of his German airsoft guns. Yip has been fascinated with WWII since he learned about the subject in fifth grade, which sparked his interest to research the equipment, uniforms and vehicles used. He then assembled his first uniform, a Soviet uniform, in the eighth grade and later bought his German uniform in his freshman year. Since then, Yip has expanded his vast collection into the equipment and uniforms from various other countries, with his field of specialization focusing on authentic German and Chinese Kuomintang style uniforms. Yip recalled wearing his uniform to his AP European History class for a presentation and how impressed his teacher, Emily Clark, had been. On the other hand, Su just recently delved into WWII after his friend Yip introduced him to it last year. “It gives you a new face to put on, so you’re like an actor,” Su said. As a relatively new enthusiast to the world of WWII uniforms and reenactments, he mostly joins Yip in reenactments and activities. Although Su only possesses a Chinese Kuomintang tunic, he owns around 14 airsoft guns; Yip owns roughly 20.